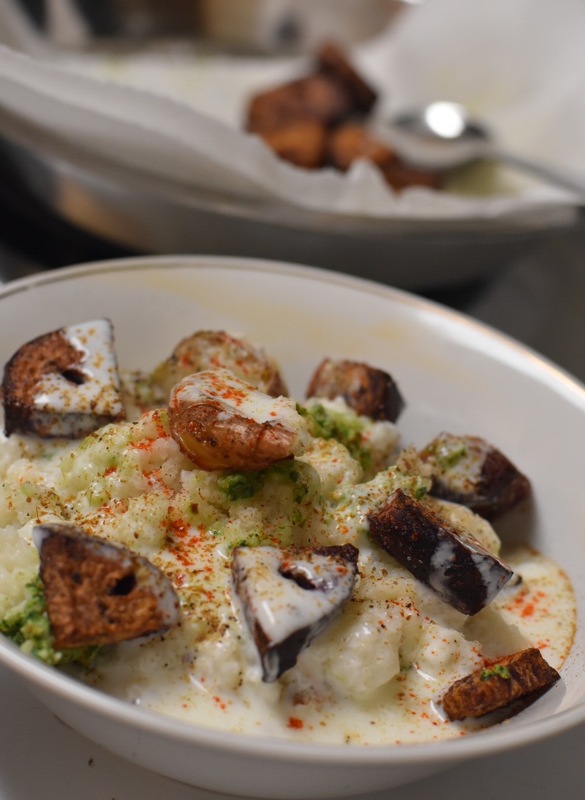 Baked dahi vada is very popular North indian street food with my baked twist to the traditional recipe for healthy version. It is having all the taste your palate needs without any compromise. If you have checked my baked moong dal falafel and baked vada then you might know that frying is becoming obsolete in my recipes. 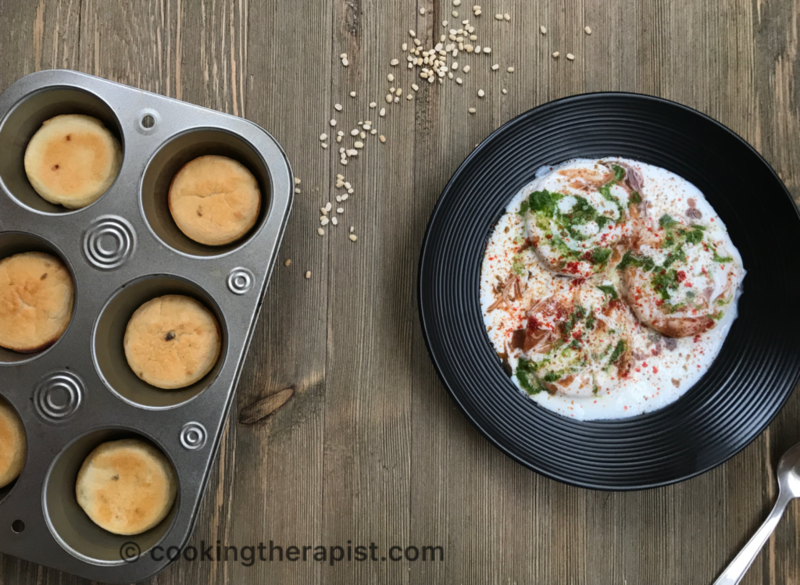 This healthier version of dahi vadas are high in protein because of urad dal and yogurt. For making this recipe you need to check Baked Vada recipe. 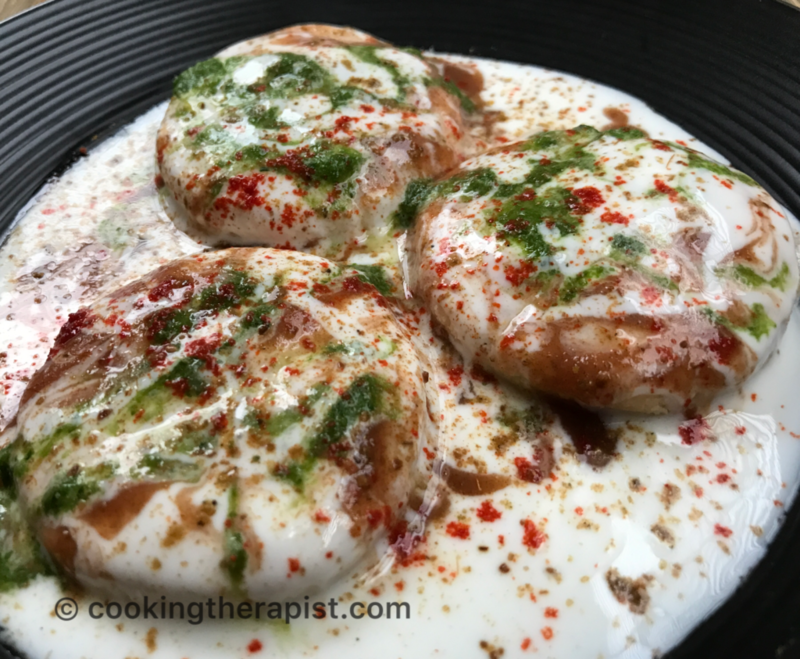 Baked lentil vadas soaked in the thick yogurt with green and tamarind chutney. Add Baked lentil vadas to warm salted water for a 30 sec to a minute. Take it out and press it gently to squeeze all the excess water. Place it into the plate. Take 4-5 vadas and keep it in a bowl or deep plate for assembling dahi vadas. Whisk yogurt and add little bit of salt to it. Add 2-3 tbsp of thick yogurt, 1 tbsp of mint and cilantro chutney and 1 tbsp of tamarind chutney. Finally sprinkle some red chili powder and roasted cumin seed powder and your healthy chaat without any compromise is ready to serve. For any party or gathering make vadas ahead of time and assemble it when you are ready to serve. You can buy tamarind chutney at indian grocery store to make this process fast. Make green chutney (cilantro chutney) by blending 1 cup of cilantro, salt to taste, ½ medium hot green chili and 1 teaspoon of lime juice all together. Enjoy this calorie saver yummy chaat version and let us know. Nutrition note: Urad dal contains high amount of iron contain too, so if you are looking for great iron absorption or for increasing Hemoglobin(Hb) level then skip yogurt and have it with chutney or Sambhar. If you are looking for recipes to increase your Hb level then do not forget to check my Gorgeous green curry.